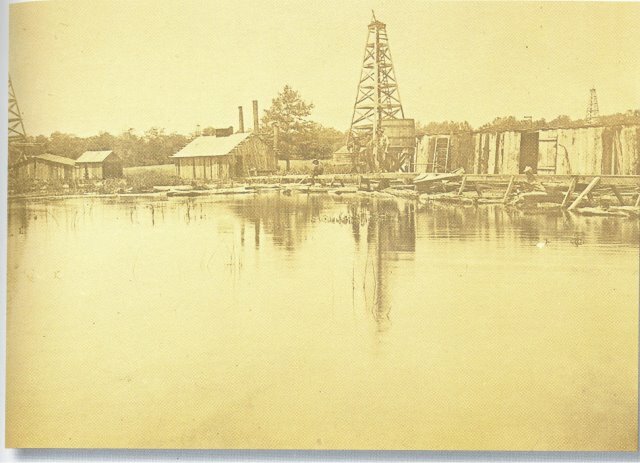 Oil Wells on the Reservoir in the 1890’s is one Chapter in the upcoming book, “Mercer County Ohio Oil & Gas Well History,” for the September 9, 2018, Sunday afternoon exhibit, at the Mercer County Historical Museum, 130 East Market, Celina, Ohio. The Fourteen Townships of Mercer County will include the historic newspaper reports of oil and gas wells drilled in Mercer County, and photographs from 1886 through the turn of the Century. Interviews of today’s citizens, who recall the oil and/or gas wells on the family farms will be included for each of the Fourteen Townships. Family Interview Reports are arriving in our Mail Box, and/or via Email, each week. Among my favorite historical photographs are of the derricks, with the boilers, and related equipment. Equally important are the photographs of the “on the site gushers, following the drop of the Go-Devils into the well.” I am fascinated by the oil and gas well stories people are sharing for this book. The Oil Derricks on the Reservoir and across Mercer County will be the exhibit for Sunday, September 9, 2018, at the Mercer County Historical Museum, Celina. This new book is just one service the Mercer County Historical Society provides to the County. The local Combined Services Appeal and the local Combined Drives help the Society print these books to preserve your local history. The stories of the rise and fall of the Standard Oil Co., Ohio Oil Co., Lake Mercer Oil Co., the Fort Recovery Oil Co., The Empire Oil Co., The Marathon Oil Co., The Pioneer Drilling Co. with the Cooper Family now at Van Wert County, and the local Well Drillers here in Mercer County. . . are each finding their place in this history book. Nearby Counties of Van Wert, Auglaize, Allen, Shelby and Darke Counties have entries in this book, also. Our neighbors in Jay County, Indiana, as well as the historic City of Kokomo, Indiana, relate to this topic. For Geologists, the Trenton Oil Field is the Common Denominator of these oil and gas wells. Do you remember the book, “Those Magnificent Big Barns in Mercer County, Ohio?” I could never have written that book, if it were not for all of the local family stories and photographs which went into that book of over a thousand big old barns in Mercer County. The 1978 “Mercer County History Book,” was another book which I could not have completed without your help. I could list the thirty books, which we have published, with your help. Our New Idea Historic Preservation Committee is now on its fourth book, about “New Idea Company’s Hay Tools.” One other Committee is in the process of putting together a unique History book, but I will wait until it is ready to print before I tell you about that book. I do have one last major book in progress in my computer, of which the research is completed; I just have to prepare it for the printer. This may be your last chance to be included in this County History Book about oil and gas wells, The thirty some local history books which the Mercer County Historical Society has published, have been the gifts which give on giving. I still receive requests for copies of those books. When you have the opportunity to donate to the Combined Services Drives in Mercer County, you are most welcome to include a donation to help support the Mercer County Historical Society. In case you are wondering, this County Historical Society receives no funds from the Mercer County Commissioners, as they did in the past. The Exhibits the County Historical Society presents and the Local History Books which the County Historical Society has published, all preserve your local history. All of these Services have expenses which the Society meets. The Society also pays the utility bills, telephone bills, and alarm system bills, for the County building, the County Historical Museum, which the County does not pay. The Society can use your help. Thank you from the Future Generations who will value Mercer County’s History. If you care for Mercer County’s History, stand up and be counted, while the Mercer County Historical Society and Mercer County Historical Museum are still here! [Mercer County Historical Society President Joyce Alig, may be contacted at 3054 Burk-St. Henry Road, Saint Henry, OH 45883, or histalig@bright.net or 419-678-2614.